The tragic January 13 earthquake that devastated the country of Haiti and killed an estimated 200,000 people inspired a wealth of online activity. The online communication site Twitter played an especially large role as it quickly filled with Haiti-related information and ways to offer aid, according to this week’s analysis of social media by the Pew Research Center’s Project for Excellence in Journalism. Social media became central to the fundraising effort that raised millions of dollars. Blogs and Twitter have played critical roles in spreading information and awareness during other international events, such as the June 2009 protests in Iran, according to PEJ’s data. But the fundraising element here is something new-giving people fast, direct access to action. Social media also became a source of information, offering first-hand accounts or assembling details which some mainstream media outlets then posted on their own websites. 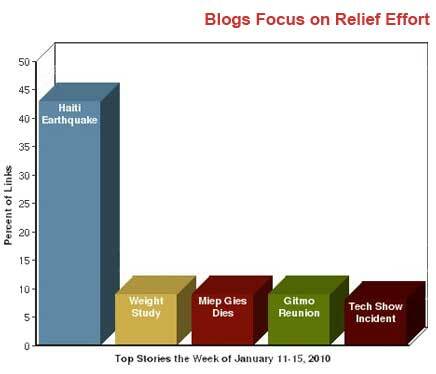 For the entire week of January 11-15, 43% of the news links in blogs were about the tragedy in Haiti according to the New Media Index produced by PEJ. And, the event did not even occur until the middle of the week. For Thursday and Friday, 82% of the news links were on the subject. On Twitter, two different levels of activity emerged. In terms of posts that linked to other reports, Haiti was the second largest topic, receiving 15% of the news links for the entire week (and 36% for the two days of Wednesday and Thursday). But another phenomenon was occurring as well: tweets that didn’t link people to fuller news accounts, but instead gave them direct access to take action-often in the way of donating money or supplies. According to the Twitter-tracking service Sysomos, 2.3 million Tweets included the word "Haiti" or "Red Cross" between January 12 and January 14. There were also 189,024 tweets that included "90999," the number that could be used to text message a donation to the Red Cross. Other online entities played a role as well. On Facebook, a number of Haiti-related groups materialized. According to CNN.com, the largest group-Earthquake Haiti-had nearly 170,000 members by Thursday. News organizations also used their Web sites to provide real-time information and ways visitors could help. MSNBC, for example, created a list of organizations that were providing aid and encouraged donations. But many news sites made use of information initially posted by social media. Ultimately, according to CNN, the use of social media helped raise $8 million by the end of the week. 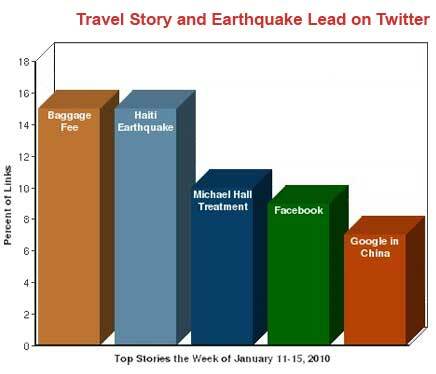 According to an analysis by Nielsen Wire of their Web tracking data, Twitter was the primary place people turned to in order to interact with others about the quake. "While most online consumers rely on traditional media for coverage of the quake, they are turning to Twitter and blogs to share information, react to the situation and rally support," Nielsen wrote in a blog post. What stood out even more was that most of the tweets were calls for direct action-specifically to give money-rather than links to other sources of information or news. In fact, the majority of the 2.3 million tweets on the subject were not original posts, but were instead re-tweets of something another person had already posted. According to Sysomos, 59% of the tweets about Haiti were re-tweets. Many of those re-tweets involved the campaign to use text messaging to raise funds for the Red Cross. Anyone with a cell phone could text the word "Haiti" to 90999 and $10 would be added to their phone bill as a donation to the effort. With the added endorsements of the White House blog and Secretary of State Hillary Clinton, the Red Cross reported that it raised $8 million that way by Friday, a far greater amount than in any similar attempt. The previous high, according to the New York Times, came in 2008 when the Red Cross raised $190,000 after Hurricane Ike. Other charities used similar methods to raise funds. Haitian-born musician Wyclef Jean asked his 1.4 million Twitter followers to donate to his foundation by texting the word "Yele" (the name of his foundation) to the number 501501. He reportedly raised $2 million. A controversy ensued later in the week as some watchdog groups questioned the relationship between Jean’s private businesses and his charity, although the singer denied any wrongdoing. Celebrities were another element of the campaign as many passed along requests for donations to their Twitter followers. Actress Lindsay Lohan, for example, tweeted "Yele Haiti now for the disaster…Please do all that you can. Please." Other active celebrities included cyclist Lance Armstrong and actor Ben Stiller. In addition to the fundraising efforts, a number of social media users linked to sources for additional, real-time information. Even many of these links were about ways people could help. Many Twitterers, for example, linked to MSNBC’s list of charitable organizations that were active in the relief effort. There were few original comments made as most simply re-tweeted (or copied exactly from another’s tweet) the message, ""RT @GWPStudio: LIST of Resources to ♥ #Help ♥ #Haiti ♥- (Plz RT) RT." Others linked to mainstream news stories that were of particular interest to them such as a CNN.com report about the town of Jacmel where residents burned tires in order to light up the town. "Confirmation now that Jacmel is mostly destroyed. Still no word from anyone there," tweeted Adam McGee. And on blogs, where authors have more space to elaborate on their thoughts, many commented on the role social media was playing. "Even though most of us fans are a world away from the earthquake that took place in Haiti, thanks to technology via the internet, digital photography and other means, the imagery conveyed in the past two days makes what happened there much more real," wrote Maryland Orioles’ Fan. "Citizen media, including blogs, video reports and Twitter are becoming more influential as sources of information these days," summarized Kajsa Hallberg Adu at Rain in Africa. "If anyone ever doubted that blogging and tweeting could go beyond navel gazing, I guess today we have evidence of the contrary." "It’s times like these that I’m amazed and in awe of how the world community can come together to help those in desperate need," added Marie’s Blog Café. The immediacy and availability of social media was so strong that even a number of mainstream news organizations used it as a way to deliver first-person sourcing as events unraveled. CNN.com, for example, was monitoring tweets from those in Haiti and created a page where they listed some of the most notable comments. "Just experienced a MAJOR earthquake here in Port au Prince – walls were falling down. – we are ALL fine – pray for those in the slums," wrote a user named troylivesay who was in Port-au-Prince, Haiti. The BBC offered live updates including statements from political leaders, tweets from those directly affected by the quake, and additional pictures. And the Wall Street Journal offered slide shows of pictures of the devastation taken by individuals on the ground. Even Web sites without the resources of a traditional news organization were able to find and assemble useful information from social media. For example, Alex Howard of the Web site digiphile used search technology to relay posts on Twitter feeds coming from people within 50 miles of the earthquake. He also discovered pictures that had been posted on sites like Twitpic that illustrated the extent of the damage. One photo was of a devastated building that was soon featured on the home pages of CNN.com, NPR.org, and LATimes.com. The rest of the top stories in the blogosphere last week all originated from the BBC. A story about British researchers who claim that having extra weight around one’s hips, backside, and thighs may protect against heart and metabolic problems finished second with 9% of the week’s links. The death of Miep Gies at the age of 100, the last surviving member of the group that protected Anne Frank from the Nazis during World War II, was third also at 9%. Fourth, again at 9%, was a profile of a former Guantanamo Bay prison guard who reunited with two of the men he held captive to express his regret about how the prisoners were abused. Both former prisoners live in England. And fifth (at 8%) was a video of a reporter who broke a phone at a Consumer Electronics Show in Las Vegas that was marketed as being "unbreakable." On Twitter, the most linked-to news story of the week (with 15% of the links) was a CNN report about Continental Airlines’ decision to match Delta Airlines’ increase for checked luggage. Next, following links to stories about Haiti, was a report that actor Michael C. Hall is undergoing treatment for Hodgkin’s lymphoma (10%). Two stories about Facebook, including an attempt to increase their e-commerce team and a partnership with McAfee to provide better security, finished fourth at 9%. And a report about the conflicts Google is facing with censorship in China was fifth at 7%. The main theme of the most-viewed news videos on YouTube last week was the use of surveillance video. Three of the top five videos prominently featured such footage. The top video was from last May of a drunken bus driver in New York state who got lost and put the students at risk. The driver recently pled guilty to 37 counts of reckless endangerment and was sentenced to 90 days in jail. Fortunately the students were able to evacuate on their own. The fourth video was unedited surveillance video of a woman at a Kansas City McDonald’s who went on a rampage after being disappointed with her order. She caused thousands of dollars of damage and police released the tape in an attempt to identify and catch the woman. And the fifth video was a report from the Associated Press that used surveillance video to show a man sneaking into a terminal at Newark Liberty International Airport after the guard left his post. The report also included interviews with travelers expressing concern over the demonstration of poor security practices.